These crispy sweet potato goat cheese puffs are great as a party appetizer or just a fun side to dinner. I’m going to bet that there will be quite a few posts today about Madonna’s performance, some Budweiser commercial, so and so’s horrible play…blah, blah, blah. But guess what? I don’t have cable, I didn’t watch a second of the superbowl and so I have nothing to say about it. I do have some cheesy balls for you though. Crispy, cheesy on the outside, creamy and sweet on the inside. Personally, I think that sounds way better than anything having to do with football. I find that experimenting in the kitchen is best done on a full stomach (kind of like grocery shopping) so that I hopefully avoid shoving whatever’s just come out of the oven straight into my face once it’s cooked. There was no hope with these. I ate lunch right before and still downed 3 immediately. As in, they didn’t even make it into the pictures. While I don’t have any picky eater kids at home, I couldn’t help but think how awesome these would be for them after popping a couple in my mouth. 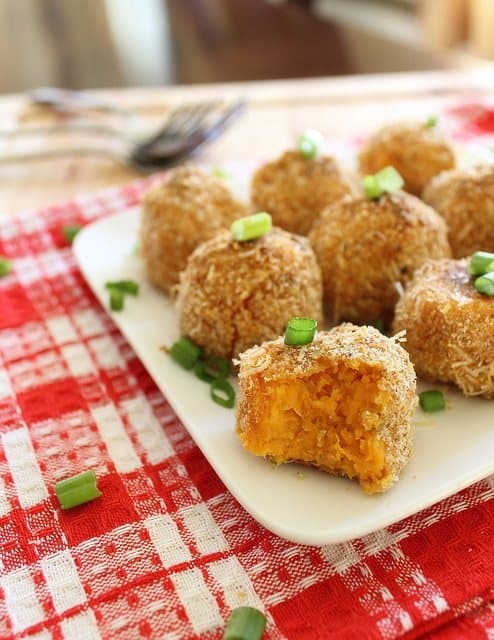 I know I wasn’t a huge sweet potato fan when I was younger, but if someone had mixed them with goat cheese and rolled them in parmesan and breadcrumbs, I’m pretty sure I would’ve eaten a few and not complained. Or more likely, I would’ve put up a front and still complained but secretly loved them. Yeah, I was that kind of kid. Not that I wanted to watch the game at all last night, but it’s kind of a shame I didn’t have a superbowl party to bring these to. I’m thinking they would’ve gone like hotcakes. Instead, I sat home alone, watching Mad Men, playing words with friends and eating these on my couch in sweats. Not sure what’s more pathetic, the fact that I had no where to go or that I actually preferred it that way so I had more of the cheesy balls to myself. So, who ended up winning anyway? Bring a large pot of water to a boil. Salt water and place potatoes in pot. Cook for 15 minutes until fork tender, drain. Place cooked potatoes in a large bowl. Add goat cheese, butter, milk, 1/2 cup of parmesan, 1/2 teaspoon rosemary and a generous amount of salt & pepper to taste. Mash together. Refrigerate for 20-30 minutes until chilled. Line a baking sheet with parchment paper or silpat. In a shallow bowl, combine breadcrumbs, remaining parmesan cheese, remaining rosemary, salt & pepper. 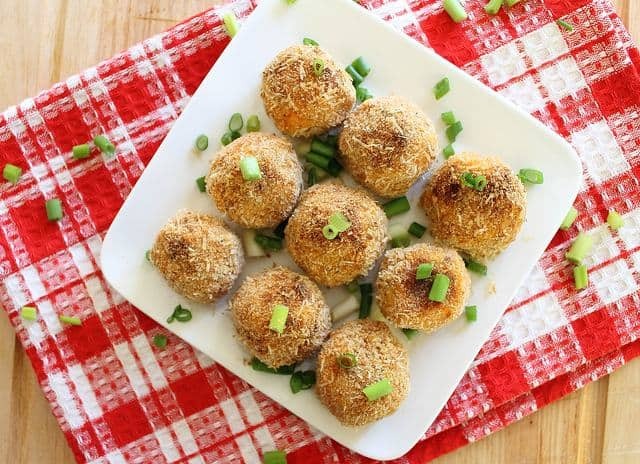 Roll potato mixture into small balls (ping pong size or smaller). 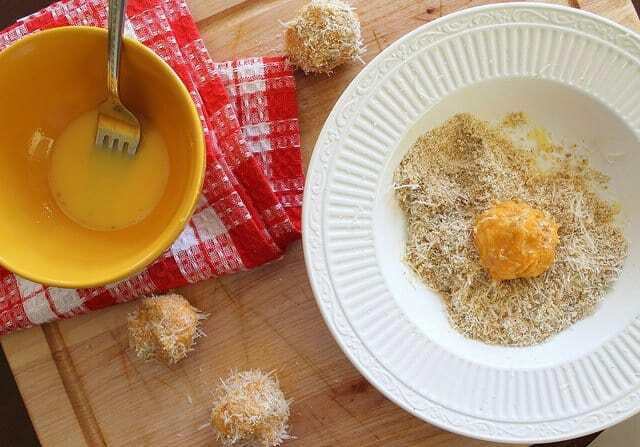 Coat balls in egg and then transfer to breadcrumb mixture, rolling around until completely coated. Place on baking sheet. 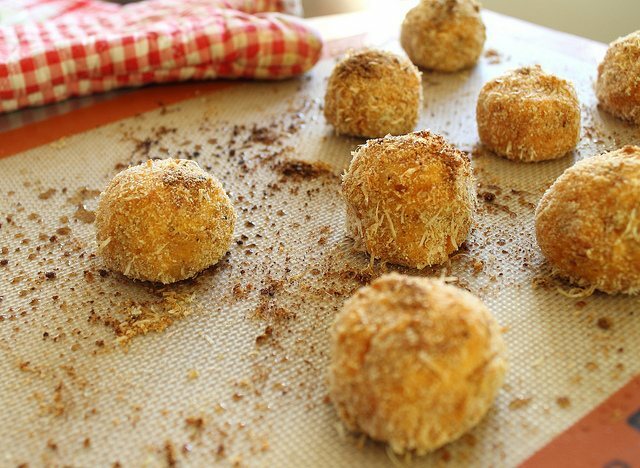 Spritz balls with olive oil or baking spray and bake for 15 minutes. Turn oven onto Hi-Broil and bake for 5 more minutes until golden brown and crispy. ahhh just pinned these, they look so incredible. Every flavor in there is one of my favorites, and I’ve been adoring goat cheese lately- I go through phases. Gotta make these soon! um, YUM! I’m not a sweet potato fan myself but I’m positive you can convince me to pop a few of these babies in my mouth because of that goat cheese. I barely watched the game last night. We had a party but I mostly did it cause I wanted to make super bad food. Madonna’s performance was a meh. Funny how you mention the kids ;) I was literally thinking how these would be PERFECT for Peanut because she LOVES sweet potato and these just look fun! Those sound heavenly! Two of my favorite foods! Your night sounds way more fun than watching the Super Bowl. I only half-watched it, but even the commercials this year were kind of blah. I’ll take Mad Man over football any day! These look great! I was at a superbowl party and brought my laptop so I can blog. I’d rather be cooking. Lol! When those kids do come, I bet you won’t even get to eat one of these puffs! Oh my gosh I don’t even like goat cheese but I just want to shove these in my face! I love putting goat cheese in my sweet potatoes, these look like an even better version of that! I love these and I love that they’re oven baked. I would gladly sit on the couch, hogging these balls all to myself! Your balls have really been doing it for me lately! I have tried and tried, but I just do not like goat cheese. How do you think these would do with ricotta instead (cause that stuff I could eat by the [very large] spoonful)? Not sure about ricotta. Taste wise it might be ok, but I think the consistency/texture might be a little funky. But hey, if you love it give it a shot! Cream cheese would also be a good substitute if you like that. these look magical..AHHH..must make now!! I’d take Mad Men and cheesy balls over the superbowl ANY DAY. Don Draper + pumpkin and goat cheese = heaven. Wow these take sweet potatoes to new levels. LOVE the idea! I, for one, am thrilled that you did this instead of watching the game. This is sooooo much better. I sat at home, didn’t watch the game, and nursed a post brunch and subsequent nap mid-day hangover. It could have been way worse than it was. It would have been better with sweet potato puffs. Wow, those look great! Goat cheese and sweet potatoes?! Amazing flavor combo… I came here from Clean Eating Chelsey blog, and what a wonderful place you have here! Marina, I love it too!!! looks aren’t everything ;) Glad you still liked it! You must have some sweet potatoes lying around! I am so tempted to go out and get sweet potatoes now, it looks pretty easy too. Hope you enjoyed your non-super bowl sunday! 2) Didn’t watch the super bowl. OK I lied. I watched the last 5 minutes. Now tyhis is an amazing recipe! I am soooooooooooo making this! I can not wait!! Now this is a recipe! I am soooooooooooooo going to make these!! Maybe I’ll do a double batch sweet potatoes for me, and white for hubby and teen. They don’t like sweet potatoes, crazy huh? Holy cow. Sweet potatoes and goat cheese… two of the greatest things ever! These look so amazing, I will definitely be making them. Is it bad that I am kind of excited Jordan is going away this weekend and I can make some of these without him complaining. Seriously delicious! Good morning! 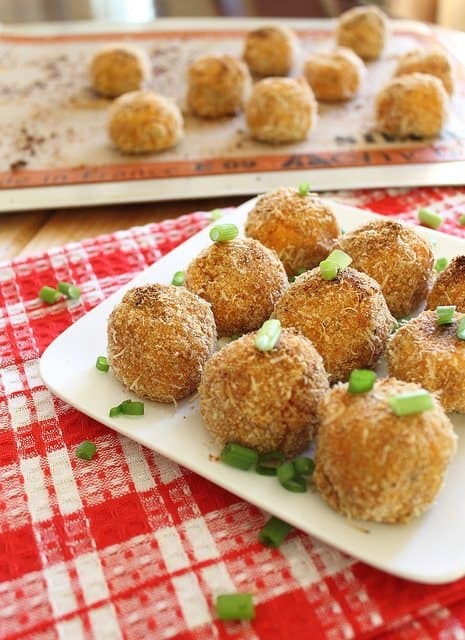 I could see myself eating these sweet potato balls for breakfast with a fried egg…or really any time of day. After trying them with goat cheese and parm, I’d probably throw in some gruyere as well. Thanks for the idea and congrats on having this recipe featured on Tasty Kitchen! Wow these were mighty fine. I made this for a family dinner tonight. I replaced goat cheese with feta + cream cheese because my grocery was out. DELICIOUS! All of them were gone! So glad you all liked them! I made these last night. AMAZING!! I changed up the spices a bit and used greek yogurt instead of butter and added jalepeno bits. My boyfriend loved them. Great way to mix up sweet potato recipes! I love hearing how everyone has been changing these up just a little and still loving them. So glad you liked it! :) Love your addition of jalapeno. Might try that next time! So is there anything sweet added to this sweet potato side dish or is it just a savory dish? The ingredients are what you see in the recipe, it’s a savory sweet potato side dish. These sound wonderful and might just be the thing I’m looking for to round out (punny!) the menu for a Hawaiian-inspired wedding buffet. Have you tried freezing the balls before putting the breadcrumb mixture on them? I will be making them soon as a dry run, but in your opinion would I be out of my mind to make them for 175? Sounds delish! Do you think these could be frozen before or after baking? I’m honestly not sure but if I tried it, it would probably be before baking and rolling. I had some goat cheese potato puffs at a restaurant this weekend, and immediately started searching for a recipe which led me here! :) Only difference was the restaurant’s version were regular potatoes and not sweet potatoes. Do you think this substitution would work in this recipe? Probably. Haven’t tried it but doesn’t seem too drastic of a change. Hey Gina- I’m thinking the food processor might’ve been the issue like you said. I’ve never had them not hold their shape and turn out flat so that’s really weird it happened to you. I’d guess it was too mashed as you mentioned. Glad they at least tasted good! Apparently that was the problem. I mashed them in the mixer for game night, and they were fine. Yeah! They were the first appetizer to run out. ;) thanks! Oops, forgot to rate it for you! These look delicious! Not sure if you’ll see this in time but I’m hoping to make this for a party tomorrow night. The only problem is that my broiler doesn’t work. Any tips on what to do for those last 5 min? HI! These look delicious, but I just have one question: do you peel the potatoes after you’ve cooked them? Nothing is stated explicitly in the instructions, but in the pictures there doesn’t appear to be any skin on them. Thank you!! Made these for Thanksgiving. They didn’t appeal to most of the guests, but I thought they were super-yummy and ate most of them myself. They were soooo good! Do you think I could make these ahead and freeze them – or just refrigerate 24 hours before baking? I would love to make them for TDay, but I would have to be able to prep them ahead. You can definitely prep most of these ahead of time (steps 1-4 in directions). I would roll in the breadcrumbs and bake right before serving though to avoid them getting mushy.